An excellent summary of the brace wearing schedule can be found on the Ponseti webpage. Initially our baby had one locally (Filipino) made splint after he completed his first series of casts. The splint was better than nothing, but proved to be totally unsatisfactory. We are lucky in that we have sufficient money to purchase Mitchell Braces after our baby has finished his second series of casts. The cost of Mitchell Braces is going to be prohibitive for many children here in the Philippines so I'm interested in alternatives available as it saddens me when children go untreated. ABOVE: Atom's first brace - this brace is not suitable for treating clubfoot and Atom's foot quickly began to relapse. 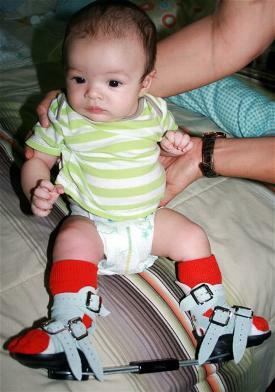 Even with a single clubfoot, BOTH feet must be placed in a brace with a connecting bar. 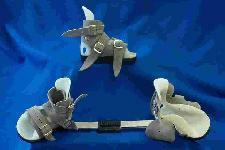 The Ponseti AFO Brace (also called the Mitchell Brace) or similar/equivalent is recommended. On 14 October 2010 Atom tried some shoes out to determine which size to order. We were instructed to order one pair of Ponseti AFO size 00 shoes (cost approx. US$264) and the appropriate size Ponseti Brace (cost approx. US$86). Total including postage was around US$400. The Ponseti AFO Brace was developed by John Mitchell in consultation with Dr. Ponseti, hence it is also often called a Mitchell Brace/Shoe. To order the brace we emailed Bittany Davison or Emily Ferguson at mdortho@farmtel.net and have the braces sent to the hospital. The company is MD Orthopaedics Inc, P.O. Box 125, 604 North Parkway Street, Wayland, IA 52654, USA. Tel 877-766-7384 or 319-256-5656. Fax 319-256-2501. It was best to try the shoes out, but they also have a foot measuring chart. These are the shoes (or very similar/equivalent) that should be used when following the Ponseti method. Atom got his braces on 28th October when he was almost 3 months old. They are great, but they took a little getting used to initially. We can now put the shoe on relatively quickly. Atom, too, had to get used to them, but we only had one day of upset and then they were accepted. In order to avoid rubbing and blisters on Atom's feet we put one layer of Webril undercast on his feet (left over from the casting) and then used thick socks. Unfortunately we live in Manila so his feet get hot and sweaty. We used talcum powder initially and now we use 'Lemongrass deodorising foot powder lotion' from 'The Body Shop'. It's an adult as oppose baby product, but it works just fine! When Atom is excited he lifts or kicks his feet together. He's quite strong and has already destroyed a toy with them! We are strictly following the Doctor's instructions of 23 hours a day for 3 months. After 3 months we intend to gradually reduce the wear to 20-22 hours, 18-20 hours, 16-18 hours, 14-16 hours and then 12-14 hours. We then want to keep Atom in the braces overnight and when napping until 4-5 years old. If you are interested in donating your old braces to a developing country there is information at clubfootclub.